The Girards in Voluntown got a new home from "Extreme Makeover: Home Edition." It's been close to two months since the Girard family walked into their brand new home, which built by hundreds of volunteers with the help of the TV show, "Extreme Makeover: Home Edition." They all re-united over the weekend at the MGM Grand Casino to watch the episode and celebrate a very special family. More than 2,000 people joined the family at the screening of Sunday's episode. "I could never give back what they've given to my family. Just to watch and see everyone and just say ‘Thank You’ to whoever, it’s great," Carol Girard said. Last summer, the family suffered a devastating loss. Carol’s husband Thomas, and their son, Marc, drown during a family outing. It was one in a line of tragedies to strike the Girards. The year before, fire destroyed their home leaving them to live in a trailer. 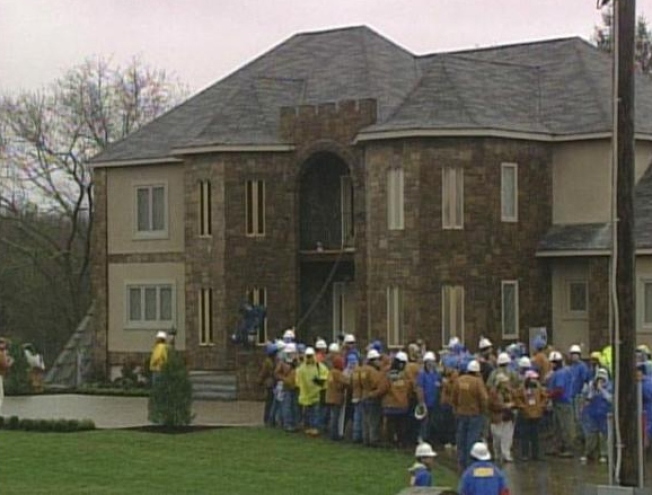 But they're luck change in December when “Extreme Makeover: Home Edition” chose the family for a new home. For more than 100 hours, volunteers and builders worked side-by-side to build the family a new 3,200 square foot, castle-like home where they can start to a normal life. This weekend, they were treated to a party. The segment aired Sunday night. "They're happy. They're smiling a lot more and laughing and that's good to see," Carol said about her four children. They all re-united over the weekend at the MGM Grand Casino to watch the episode and celebrate a very special family. MGM Grand Casino hosted the party. "It’s a reunion with the builders and the volunteers," Dino Tudisca, a project manager, said. "The hard part’s done, cause that was a tough week. Everyone persevered. Now it’s kind of time to sit back and celebrate." The crowd was treated to music and video clips of the show. Peter Harding of Competitive Resources presented the builders and the volunteer with a certificate for their green construction. "It uses 80 percent less energy than a normal home and that's a combination of good construction using a lot of insulation," Harding said.